Features: Improved Rhythm Engine brings smoother and more realistic racing feel. Variety of racing modes, including the new Endurocross. X-Cross Tournament brings together 8 unique racing series into one ultimate offroad championship. Multiple vehicles to race with Upgrade your vehicles with 100+ sponsor parts and accessories. 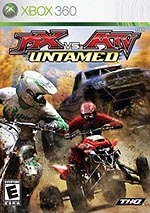 Description: 'MX vs. ATV: Untamed' kicks it up a notch and shifts into high gear! Rainbow Studios has evolved their legendary Rhythm Racing engine to include throttle based power slides, near upside-down whips and new scrubs at full speed, all while retaining the smooth and authentic feel not found in any other game. Attempt to own the offroad by dominating the innovative new "X-Cross Tournament," which brings together 8 unique racing series like Endurocross, Opencross, Supercross, Waypoint and Supermoto and then crosses them into one ultimate offroad championship! Verdict: 'MX vs. ATV: Untamed' takes everything fans love about off-roading and tries to cram it all into one neat console experience. Not content to just settle for MX motorbikes and four wheeled ATVs, the game also decides to throw in the Monster and Trophy Trucks, Buggies and even the occasional Golf Kart for good measure. Of course, including those in the title would have taken up most of the front package, so the MX vs. ATV moniker is good enough. Players race to their hearts’ content through eight different events taking place in all sorts of environments, from small indoor dirt tracks to huge outdoor swamps and deserts. If you’re a fan of the MX vs. ATV series, particularly last year’s Unleashed game for the PS2, you’ll be happy to know that the controls from before have survived the transition to next-gen platforms. What this means for newcomers is a fairly steep learning curve. Due to the game’s fairly realistic physics mechanics, players will have to learn how to pre-load their jumps to get decent air, and to throw in the clutch for a burst of speed after those tight corners. Adding to the experience, Untamed takes things an extra step further by adding even more nuances to the controls, such as power slides and whips maneuvers. These moves take some pretty accurate timing to make the most out of them, but they can mean the difference between taking to the air like an eagle and pulling off some monster moves, or doing a crash and burn while the rest of the pack flies past your wreckage. If you’re looking for a quick and easy arcade experience, Untamed may be a little more than you can handle. MX vs. ATV Untamed supports multiplayer via two-player split-screen and huge 12-player races over Xbox Live. Players can also compete against each other in a variety of small minigames, including Hockey, Snake and a personal favorite, Tag. Much like actually an actual off-roading experience, MX vs. ATV Untamed is a good time that occasionally gets bogged down in a muddy mess. The high learning curve and occasional visual letdown can throw a layer of muck over an otherwise prime racing experience. Still, if you’ve been following the franchise and are itching for a mud slinging, log jumping, tire spinning, air grabbing, next-gen good time, odds are you’ll want to check out MX vs. ATV Untamed.